With ample space and gracious ocean views, guests can live big at the charming Short II. 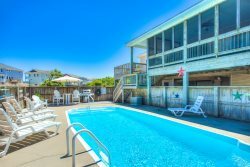 Located in quiet and accommodating South Nags Head, and just 325 ft. away or so from the beach access, this sunny home has all the comforts of home and then some, as well as easy access to a wealth of central Outer Banks and Manteo attractions. Spend days on the shore, or hop across the bridge to discover the picturesque Hatteras Island beaches. With so many adventures in store, Short II is a perfect haven for great getaways. After a long day exploring the Outer Banks, head inside and relax in the stellar top level living area with nearby dining and kitchen, as well as incredible ocean views. The second level features three bedrooms for sweet dreams – which includes two master suites – while the ground level is home to an inviting sitting area with sleeper sofa for a little extra space and privacy. With multiple levels of decks and a stellar locale, Short II has everything guests could require for a picturesque beach getaway.